Rashunda Bell began her teaching journey with Ogeechee Technical College in November 2017 as an adjunct instructor. In December 2018, she became a full-time faculty member as the Pharmacy Technology Program Director and Instructor. Mrs. Bell has been in the Pharmacy field for over 18 years. She started her career at Ogeechee Technical College in the Pharmacy Technology program, where she received her program diploma. After graduating, she earned her CPht credential. Mrs. Bell has also earned an associate’s degree in Applied Science and a Bachelor of Science from East Georgia State College. Prior to employment at Ogeechee Technical College, Mrs. Bell worked as a Retail and Hospital Certified Pharmacy Technician. The Pharmacy Technician training program conducted by the Pharmacy Technology program at Ogeechee Technical College, Statesboro, Georgia is accredited by the American Society of Health-System Pharmacists (ASHP), 4500 East-West Highway, Suite 900, Bethesda, MD 20814, 866.279.0681. All Pharmacy Technology students are required to register with the Georgia Board of Pharmacy by completing the Pharmacy Technician Application. 1. Provide educational programs and courses that serve the intellectual and career needs of individuals and the needs of business and industry. 2. Provide infrastructure and technology to support teaching, learning, and administrative functions. 3. Provide services and resources to promote student success. 4. Provide training programs and services to promote personal growth and economic development of business and industry. 5. Maintain a research-based system of planning, assessment, and budgeting to achieve expected outcomes and demonstrate accountability. 6. Advance the College through developing partnerships and securing resources. 1. 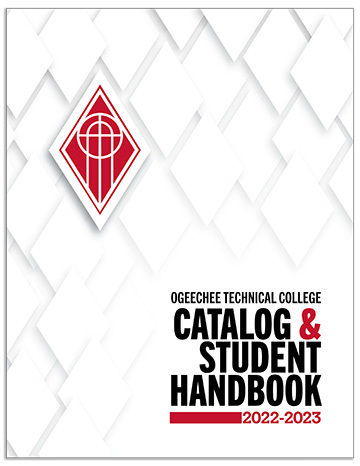 Students must be registered with the Georgia Board of Pharmacy prior to program entry (Enrollment into PHAR1010 – pharmacy Fundamentals [cohort class]). 2. Students must attend program orientation scheduled on the first day of PHAR1010 courses. 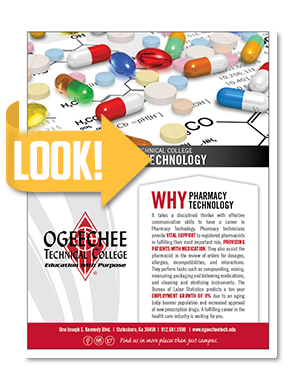 Ogeechee Technical College Pharmacy Technology Program (OTC-PTP), representing a program which is a part of a unit of the Technical College System of Georgia, is a within a public institution of higher education that contributes to the economic, educational, and community development of its three-county service area of Bulloch, Evans, and Screven counties and extends also to the areas of Candler, Chatham, Effingham, Emanuel, and Jefferson Counties. OTC-PTP is an ASHP accredited program which provides training within the 45 ASHP standardized learning goals at the diploma level with the use of traditional and distance methodologies; student support services; introduction to continuing education; certification; licensing; and practicum training rotations.